Satay is one of the most popular Asian appetizers and is loved by many people. Try out this recipe and make your own homemade satay! Slice chicken into long thin slices ,approximately 1/4″ thick and 2″ in length. Marinate chicken slices with Lawry’s Teriyaki marinade, sliced lemongrass, minced onion, palm sugar, peanut butter, coriander powder, McCormick Turmeric Ground, McCormick Smoked Paprika, cooking oil and mix well to cover meat. Allow to marinate for at least 2 hours or overnight. Before grilling, soak bamboo skewers in water for at least 10 minutes, so that they will not burn. Skewer 2 to 3 pieces of chicken onto each stick. Place completed satay sticks on a non-stick pan and grill chicken until browned on both sides and cook through, about 3-4 minutes per side. 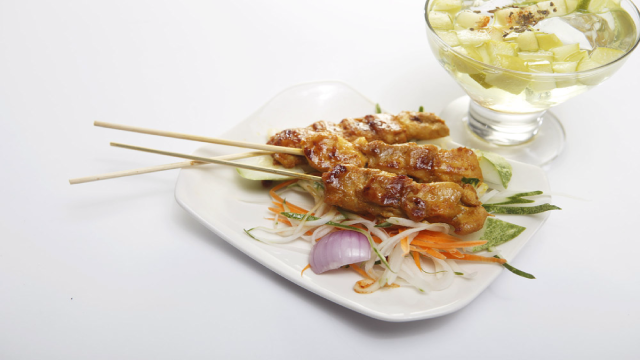 Serve chicken satay with cucumber salad, onions and ketupat rice cubes.